Description: Christian Metz is best known for applying Saussurean theories of semiology to film analysis. In the 1970s, he used Sigmund Freud's psychology and Jacques Lacan's mirror theory to explain the popularity of cinema. 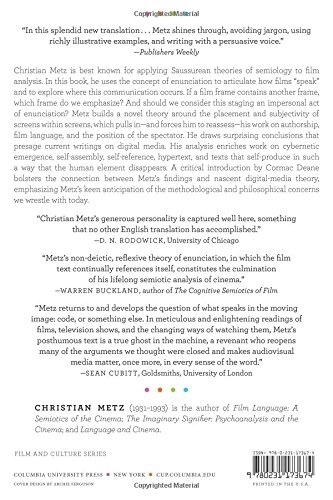 In this final book, Metz uses the concept of enunciation to articulate how films "speak" and explore where this communication occurs, offering critical direction for theorists who struggle with the phenomena of new media. If a film frame contains another frame, which frame do we emphasize? And should we consider this staging an impersonal act of enunciation? 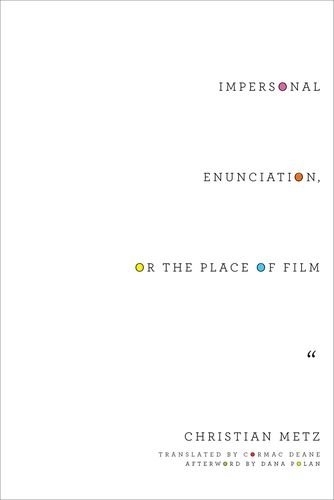 Consulting a range of genres and national trends, Metz builds a novel theory around the placement and subjectivity of screens within screens, which pulls in-and forces him to reassess-his work on authorship, film language, and the position of the spectator. Metz again takes up the linguistic and theoretical work of Benveniste, Genette, Casetti, and Bordwell, drawing surprising conclusions that presage current writings on digital media. Metz's analysis enriches work on cybernetic emergence, self-assembly, self-reference, hypertext, and texts that self-produce in such a way that the human element disappears. A critical introduction by Cormac Deane bolsters the connection between Metz's findings and nascent digital-media theory, emphasizing Metz's keen awareness of the methodological and philosophical concerns we wrestle with today. Author Biography: Christian Metz (1931-1993) is also the author of Film Language: A Semiotics of the Cinema; The Imaginary Signifier: Psychoanalysis and the Cinema; and Language and Cinema.